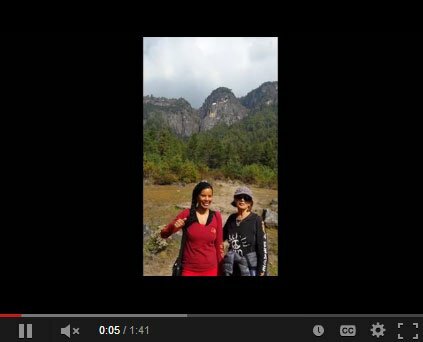 My daughter Dawn and I made the challenging climb to the most sacred monastery in Bhutan, Tiger’s Nest. This short video shows our ascent. We weren’t allowed to take in cameras or telephones, so stay tuned for Part 2 to read about what we saw and did inside. I highly recommend visiting this monastery built on a sheer cliff – it was an amazing experience! Thank you to our guest blogger, Hal Amen. This blog originally posted on Matador Network. 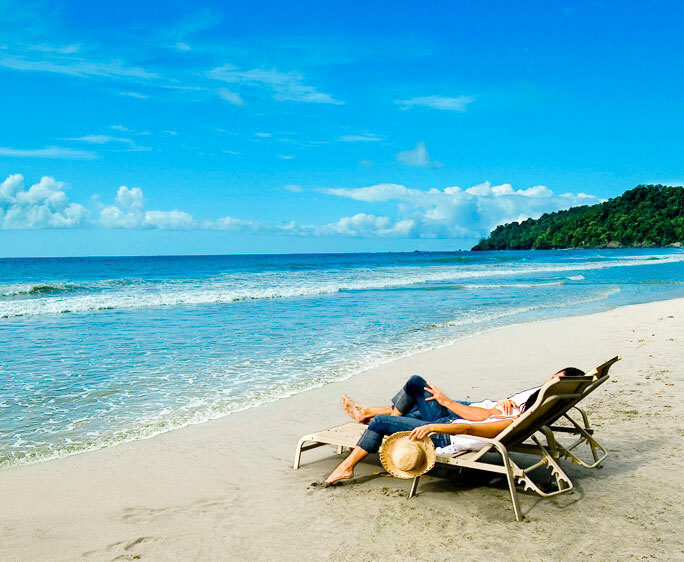 HOW MANY OF YOUR VACATION DAYS did you use in the last year? If you live in the United States, chances are the answer to that question is somewhere around half of them. 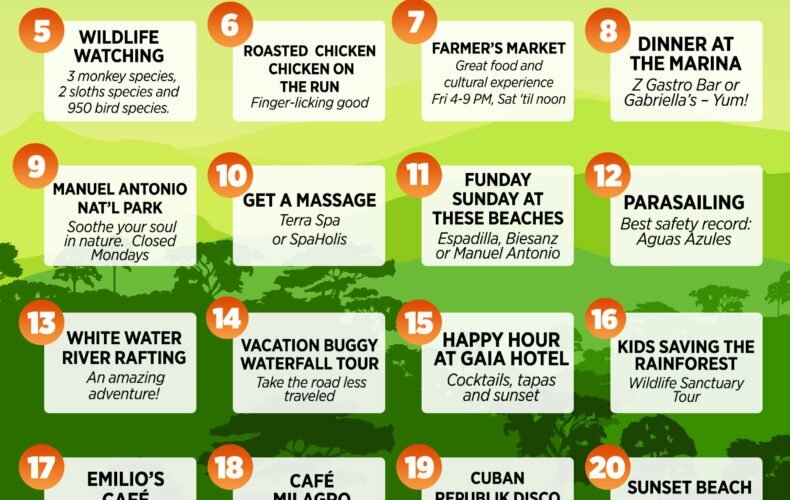 Which means you could be taking paid time off to hang out in Costa Rica right now. It’s ever so tempting to just use up all your holidays and just spend a week or so away abroad. That would be the dream. No doubt after seeing these photos, you’ll want to book the next flight to Costa Rica. If you are someone who makes impulse holiday decision, you may want to look into a site like https://www.buenavistadelrincon.com/. This will confirm your desire of visiting this country for sure. 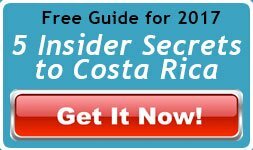 And Costa Rica is a pretty sweet place to be, whether you go for its unrivaled ecotourism opportunities, from watching sea turtles nest to ziplining through the rain forest; its 1,000 miles of coastline on both the Pacific and the Caribbean, and the spectacular beaches and surf that go along with it; or its 50 national parks, representing the nation’s unprecedented commitment to preservation and protecting a full 5% of the world’s biodiversity. 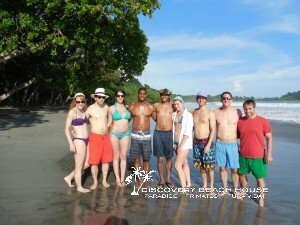 These images will persuade you to check out some bachelor locations costa rica and move! You have an amazing house. We celebrated our wedding in your house and it was the most beautiful day in our lives. The scenery could not be more beautiful or spectacular! Thanks so much for letting us celebrate it in this paradise of a house. What to say about the Staff? They are all really good and nice and made our stay very comfortable. 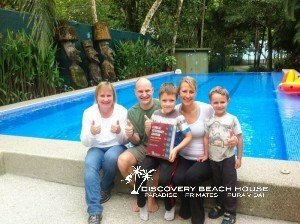 Especially Sabrina who has helped us with so many small details and was assuring that everything went well for us and our guests. I loved that Manuela, the housekeeper surprised us everyday with different towel decorations on our beds. The wedding cake made from towels was amazing – so sweet of her to do that. 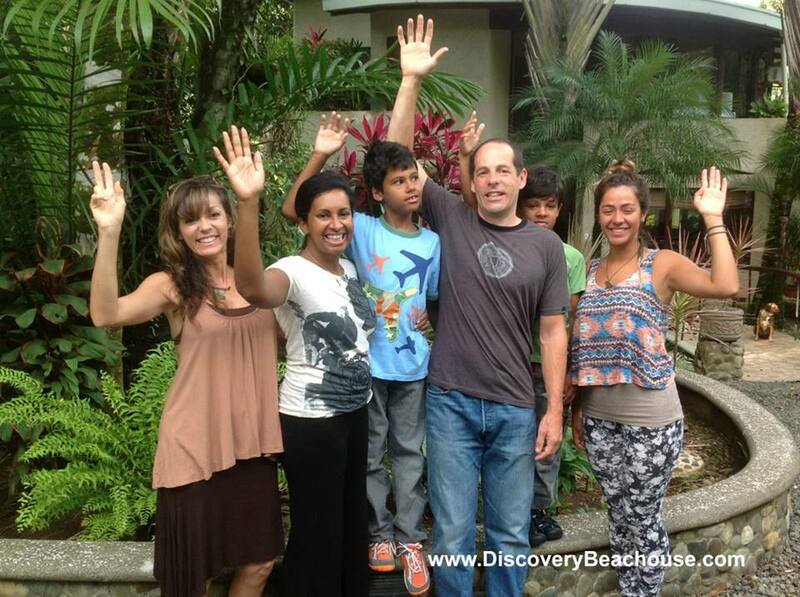 Everyone at the Discovery Beach House made us feel very much at home. 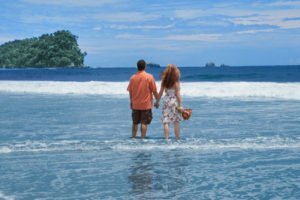 We were surprised at how much less expensive it was to get married in Costa Rica than in Italy and we loved the added bonus of getting a tropical vacation. 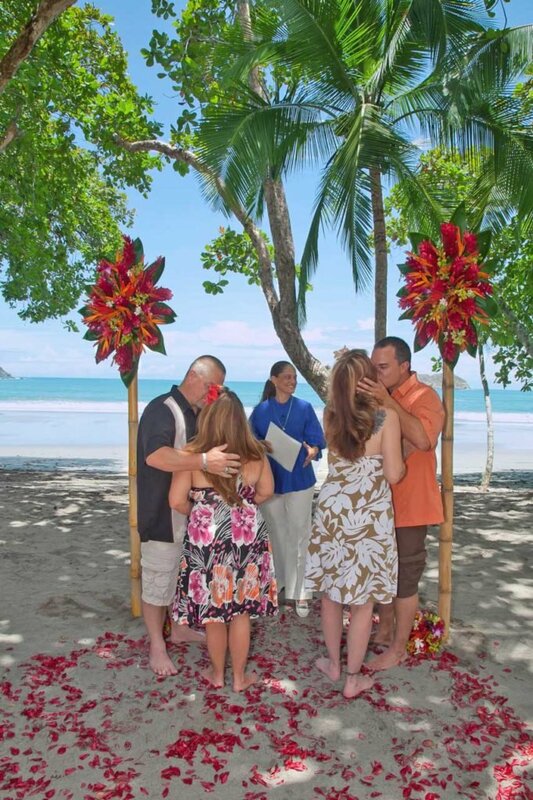 We’ll be spreading the word about getting married in Manuel Antonio, Costa Rica! So to all of you Many Thanks and Pura Vida! Thank you to our guest blogger, Pat Cheek. This blog was originally posted on Quepolandia.com. 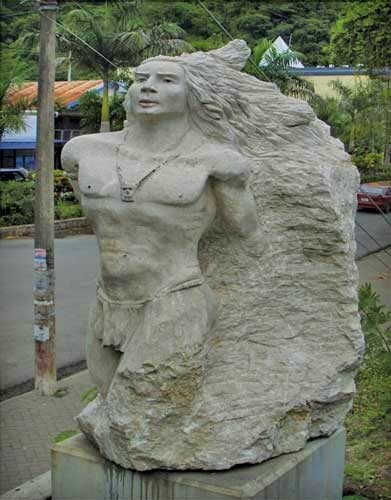 Walking along the malecón, sea wall, in Quepos you will notice large stone sculptures sitting atop pedestals. The sculptures were created in 2007, organized by the Ministry of Culture, Youth and Sports and sponsored by the Canton of Aguirre with the support of the Chamber of Commerce, Aguirre. Each sculpture was sponsored by a local business. It’s not often a groom contacts me about a vow renewal. They were staying at the Discovery Beach House in Manuel Antonio on gorgeous Espadilla Beach with one of the prettiest tropical rain forests in all of Costa Rica as a backdrop. The setting was amazingly romantic. To double their pleasure Guy’s friend Bill had decided to renew his vows with his wife Dawn as well. Both husbands managed to keep the secret until a day or so before the ceremony, just in case their wives wanted to shop or get their hair done. Smart grooms. Lucky brides. The day was perfect. 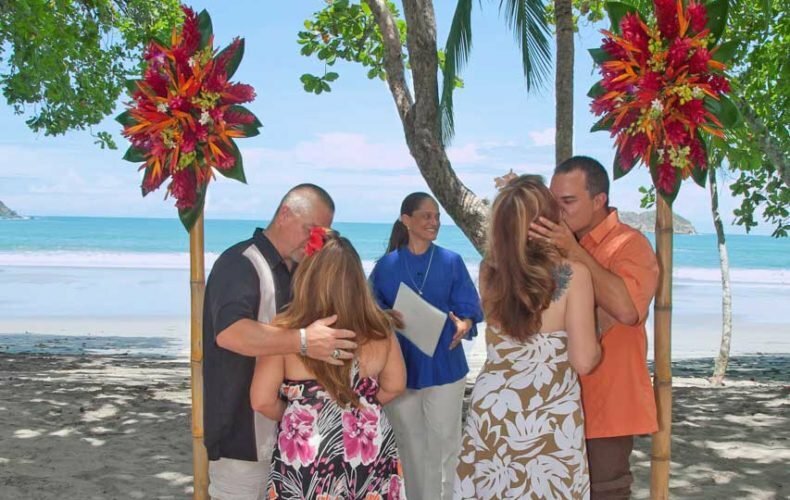 Warm weather, the salt air smell of the sea and the sound of waves softly washing the shore was an ideal setting for the two couples as they renewed their vows on the beach. Bamboo poles with tropical flower arrangements blended beautifully with the environment. After the ceremony Guy & Krista and Bill & Dawn were serenaded by local musicians. When they walked up the orchid-lined path back to the house there was a lovely wedding cake with cascading white orchids waiting for them to cut and a wonderful lunch prepared by a chef. 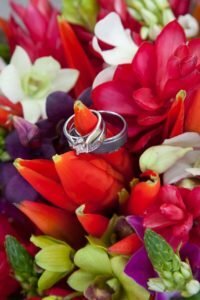 Guy and Bill – you not only proved to your wives you’re romantic; you raised the bar on how to romance and surprise your wife after a decade of marriage. 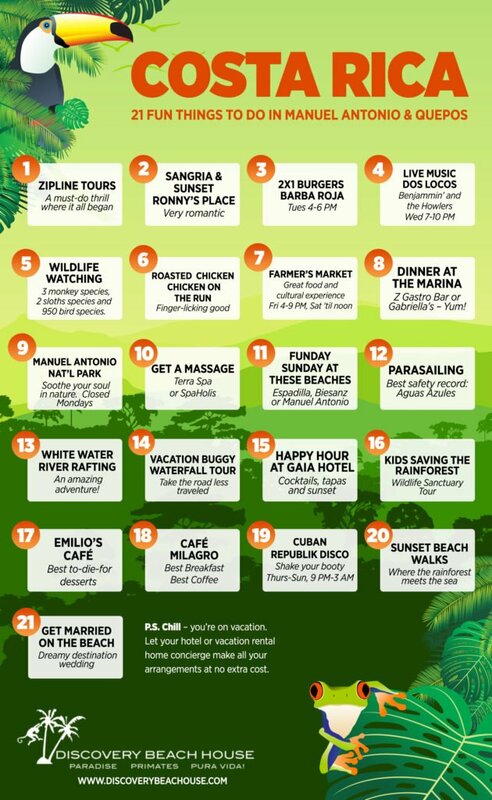 Our guest blogger, Randy Gritz from Celebrations Costa Rica blogs about a new destination wedding trend. 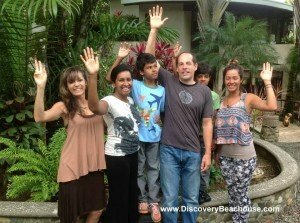 When Whitney & Daniel Pace got married at the Discovery Beach House they asked their guests to bring donations for Kids Saving the Rainforest. You can make a difference in the lives of the people who live in the community where you’re having your wedding celebration. Let’s look at some possibilities. 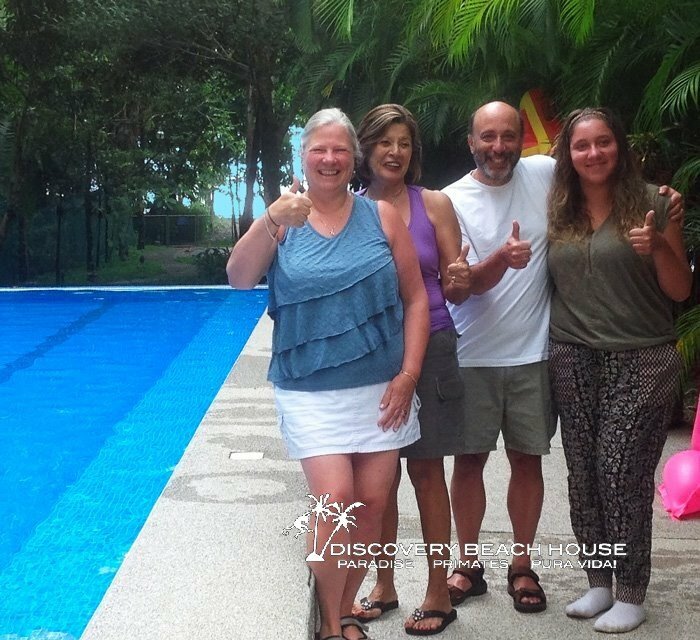 Evelyn Gallardo is the owner of Discovery Beach House in Manuel Antonio. She has been working with Pack for a Purpose. Her guests allocate space in their luggage to bring supplies to the local schools or nonprofit organizations. 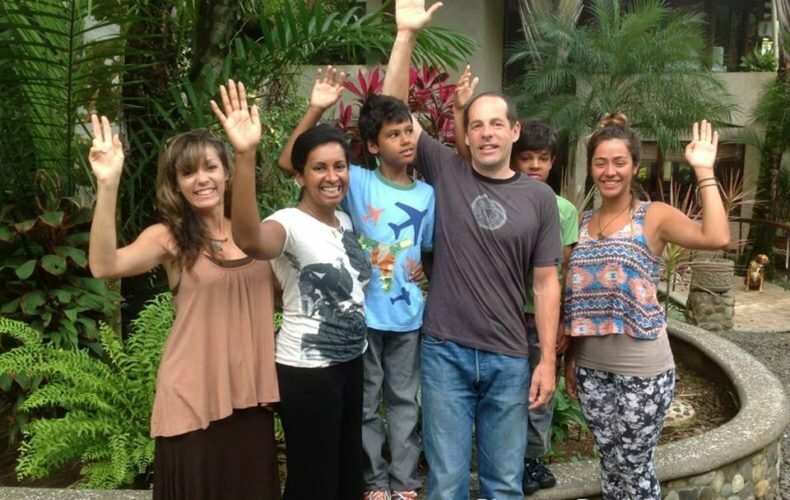 Kids Saving the Rainforest was started by two young girls living in Manuel Antonio. 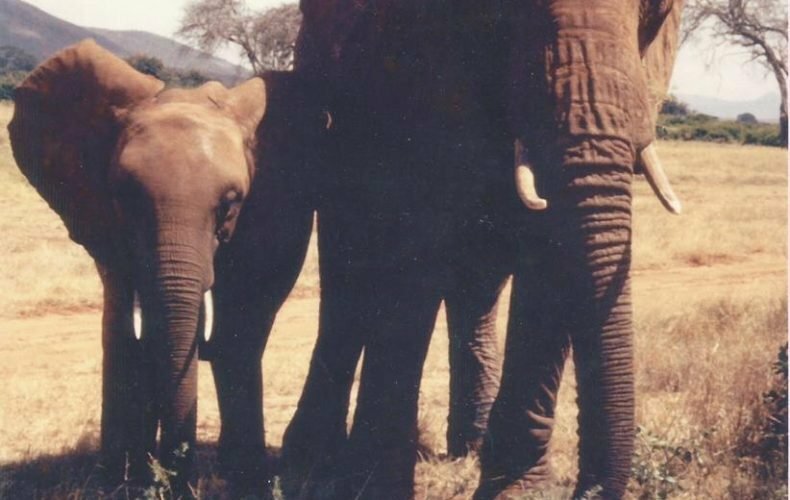 These nine year olds were concerned about the impact that the disappearing rainforest was having on the animals. Initially their organization put up “monkey bridges” that spanned over the streets so the monkeys could cross safely. 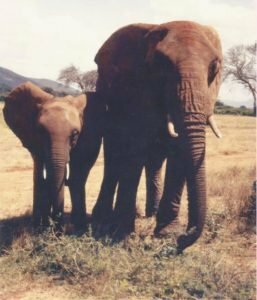 Their idea has grown and now there is a rescue center, sanctuary, and volunteer program. 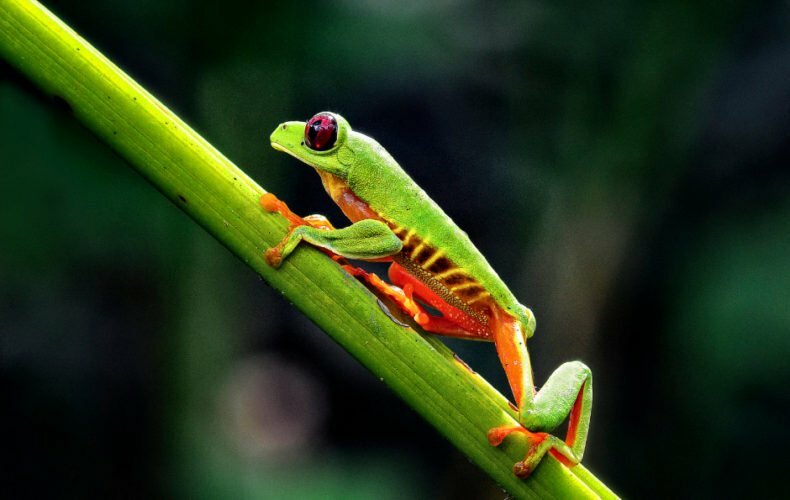 ASEPALECO, founded in 1991, is a non-profit organization that promotes the protection and sustainable use of natural resources, whose ultimate goal is to improve socio-environmental quality of life through education, training and community organizations focusing on sustainable development projects. Greentique Hotels have really stepped up and created various programs to represent sustainable practices. 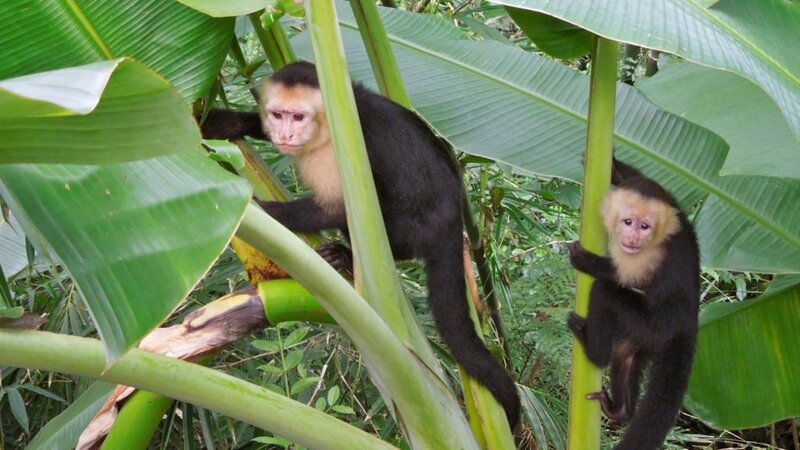 The Manuel Antonio Nature Park and Wildlife Refuge is an ongoing conservation project and nature exhibit. All proceeds remain with the operation of the refuge including the dormitory for the guides and student volunteers. The Santa Juana Rural Mountain Adventure and Conservation Projects focuses on reforestation and tree adoptions. Their tours help support many of the local families. At Villa Blanca the wedding couple and guests can adopt a tree or support school programs. Our entire family had an amazing wonderful time. I am very finicky, but this vacation was perfect. There were days when we alternated sitting by the pool and then walking to the ocean. 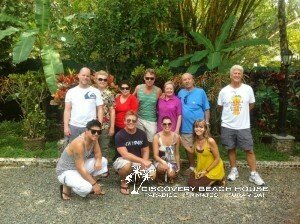 Other days, we went on adventures such as zip lining, visiting the park, white water rafting, a jungle tour and an estuary tour. Also, what made this vacation special was the staff. 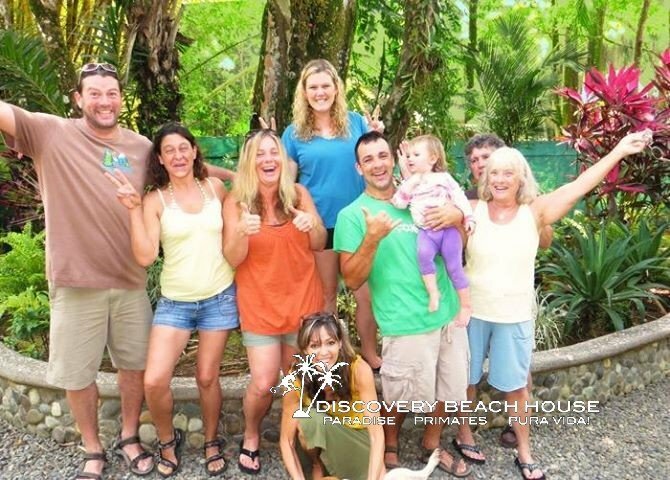 They are completely friendly and were dedicated to making our stay the best experience possible. We have traveled throughout the world. This is a very special place. We spent a wonderful week and a half at this house. I was nervous in advance, since I had never rented a vacation home online without seeing it. Thankfully it exceeded everyone’s expectations. The house was exactly as pictured with the gorgeous infinity pool and beach just steps away. We also loved seeing the monkeys playing in the trees each afternoon. The amenities were lovely and the service provided was terrific! We had daily housekeeping (including laundry!) and a fabulous concierge who took care of all our arrangements. 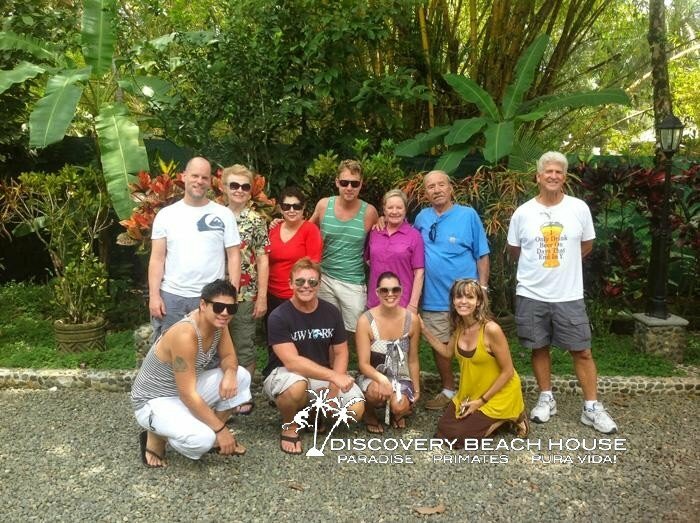 No calling for a taxi or booking a zip line or any outing – it was all handled with no effort on our part. 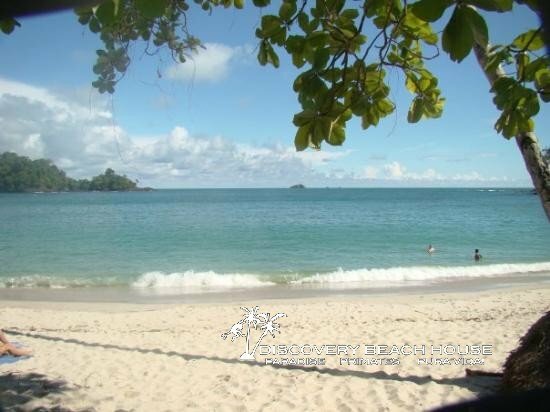 Playa Manuel Antonio Chosen Best Beach in Central America! Our very own Playa Manuel Antonio won TripAdvisor’s Traveller’s Choice #1 Best Beach in Central America 2013. Woo-hoo! 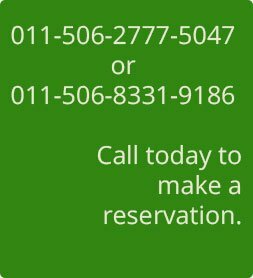 http://www.tripadvisor.com/TravelersChoice-Beaches-cTop-g291958.